Based on four decades of experience and research, Navigating Strategic Decisions explains how to improve the decision-making process in your organization through the use of better long-term forecasts and decision support. BOCA RATON, Fla. - June 25, 2013 - PRLog -- Based on four decades of experience and research, Navigating Strategic Decisions: The Power of Sound Analysis and Forecasting explains how to improve the decision-making process in your organization through the use of better long-term forecasts and decision support. Filled with time-tested methodologies and models, it provides you with the tools to establish the organization, processes, methods, and techniques required for analyzing and forecasting strategic decisions. This book provides you with the benefit of the author’s decades of hands-on experience. In this book, John Triantis shares valuable insights on strategic planning, new product development, portfolio management, and business development groups. Describing how to provide world-class support to your corporate, market, and other planning functions, the book provides you with the tools to consistently make improved decisions that are based on hard data, balanced evaluations, well considered scenarios, and sound forecasts. An indispensable guide for strategic project managers and a must book for strategic planners aspiring to advance their careers and become trusted advisors to decision makers, written by an expert in strategic decision forecasting as a comprehensive practical guide that lays the foundations toward competitive advantage. It will revolutionize your company’s strategic thinking by showing how to bring together methods, processes, and techniques toward sound analysis, evaluation, and forecasting for superior strategic decisions. Already a published authority on managing successful acquisition and joint venture projects, John Triantis has now focused on marking out a realistic, yet crucial, role for strategic forecasters participating in strategic projects. Forecasters following his precepts will prove themselves indispensable to the project team, while at the same time contributing to reduced time to decisions, better/sounder decisions, and increased chances of realizing forecasted project values. This is a must book for forecasters aspiring to make a difference in the world of strategic project decisions. Finally – a book that demonstrates the connection between the art and science of strategic forecasting and successful strategic projects is here! 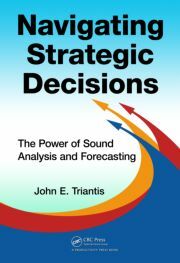 John Triantis uncovers the truths about strategic decisions to everyone in this field and is in the forefront of helping organizations understand the importance of and implement strategic forecasting. All forecasters and decision participants will benefit from John’s 40+ years of hands-on experience and practical insights. Dr. John Triantis is the consummate translator of the vernacular strategic analysis. Navigating Strategic Decisions: The Power of Sound Analysis and Forecasting is written for the professional who deals with both analysis and forecasting for strategic projects. His long experience in the real world allows him to draw from the things that have worked and enables him to make sound recommendations for industry analysts and forecasters. The reader will benefit immensely from the practical insights. The information presented is understandable and transparent. The strength of the book is that it is based on workable and practical methodologies and not theoretical concepts. An excellent book! Managers too often predict demand emotionally despite the importance of the decisions being made as a result of good fact-based analysis. Subsequently, forecasts are often extrapolations of historical volume trends, rather than well-thought-out projections. This has been the accepted process for strategic forecasting and planning for the past 30 years. This is the first book that provides a proven framework for business executives to translate fact-based decisions into viable strategic forecasts. —Charles Chase, Principal Industry Consultant, Supply Chain Global Practice, SAS Institute Inc.
Understanding how to transform data into useful information is critical in a world of ever increasing noise. This is an essential reference book for organizations considering entering new markets, evaluating product portfolio mix or developing new products. It serves as a comprehensive resource of the critical methods and techniques needed to enable strategic decisions.